We have ten computers for public use. Computers are available on a first come first serve basis. Everyone is allowed one half hour interval up to an hour per day. Children under the age of 7 will not be allowed to use the computer without an adult present. Children under 14 on Saturdays must be accompanied by an adult. Individuals may print from the computer at a cost of 25 cents per page. No food or drink is allowed at the computers. We have wifi available when the library is open. If you wish to use the wifi, just ask for the password. There is electric available in various locations for charging your devices. 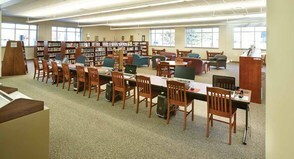 The Carrie and Arthur Hinners Reading Room has comfortable seating for a relaxing reading experience.